A Custom CMS Is The Way To Go. Here's Why. NP GroupBlogTechnologyA Custom CMS Is The Way To Go. Here's Why. There are countless out-of-the-box content management solutions out there. From WordPress and Drupal to NationBuilder and TeamSite, professionals across all business sectors have a full menu of options for maintaining content on their websites. In just minutes, a person with absolutely no coding experience can publish a basic website. Well, that really depends on what you need out of your website. With so many CMS choices, one might wonder why one should opt for a custom CMS. The answer can really be summed up in one phrase: Maximum customization equals optimal efficiency. That’s an efficiency that will trickle throughout your business. Consider these four benefits of a custom CMS to see what we mean. Every company functions differently. Building a website or app on the wrong CMS can be a bit like trying to put a round peg in a square hole. 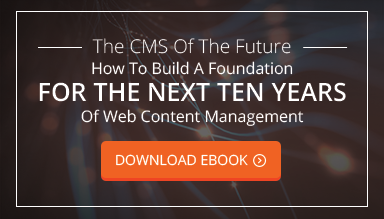 If you need more out of your CMS than it is built to offer, the headaches can pile up fast. If one of the first steps of planning your website strategy is to understand your own workflow, wouldn't it make sense to have a CMS that perfectly matches that workflow? Open-source or commercial CMS packages are limited by the rules of the CMS. A custom CMS is built around the requirements of your business, your users, and your customers. For the sake of example, let's compare how a custom CMS would benefit your primary users: the staff members that will be using it. While an open-source CMS may have some customization available, it likely already has predetermined roles for its users. Using it would force you to wrap your workflow around the design of the software instead of the other way around. This is particularly true if your site needs functionality beyond the basic structure of pages and blog posts, around which a CMS like WordPress is built. If you need a robust ecommerce section or a complex registration system for your clients, you’ll have to depend on plugins to add those features. And the more plugins you have, the more your staff will need to learn—and the bulkier your site will become, file-wise. Every organization has experienced the challenge of new software adoption. A custom CMS will speed up adoption and acceptance of the CMS and the new website by being exactly what everyone on your team expects and needs. Your website strategy is no doubt built around the goal to provide a superior user experience and differentiate your website from every other site out there, especially your competitors. So how important is optimizing performance? Consider this: According to statistics gathered by HubSpot, 40% of people will abandon a web page if it takes more than three seconds to load. And it's not just about losing those customers. Your website bounce rate spikes to 100 percent when a page takes four seconds or more to load, and it jumps to 150 percent if it takes eight seconds or more to load. Higher bounce rates will cause you to lose that coveted spot at the top of the search results you worked so hard to get. A custom CMS does not have a lot of unnecessary coding or features that will slow down your site. Yes, out-of-the box CMS programs are often free and easy. They are a great option if you just want to set up a blog and some basic web pages that you can update. However, to get any real functionality or build a robust site, you must install many different plug-ins, including ones for contact forms, social media, sliders, image galleries, cache and sharing. Many of these plug-ins are designed and written by third-party vendors, with different coding habits and expertise. The code for your website will get messy, fast. Custom CMS developers (like us) know the importance of clean code. Less code means your site load time bumps up. It enhances debugging and makes it easier for developers to identify problems in the code architecture, ensuring that any issues are resolved immediately and site downtime is minimal. Custom-built functionality eliminates the need to compromise. You won't be wasting valuable time or resources trying to fit your business needs within the limitations of an out-of-the-box CMS. Instead, you can build a CMS with the goal of optimizing your site's functionality. Popular applications are often the target of cyber criminals. This is true of commercial CMS packages. You don't have to dig too deep to find vulnerabilities. Consider some of this year's headlines: “Millions of WordPress Sites Open to Attack,” “Unusual WordPress Attack Steals Login Credentials,” or “Drupal Patches Critical Password-Reset Vulnerability.” Cyber criminals often use third parties to access sensitive information, and these vulnerabilities become well-known quickly. In fact, a benchmark study from global consulting firm Protiviti released this year notes that "organizations must make improvements to their third-party and vendor risk-management programs to keep pace with the latest risks and challenges, or they will risk suffering expensive, time-consuming, and possibly hazardous consequences." A custom CMS would limit your site's vulnerabilities. Basically, cyber criminals would have to be specifically targeting you instead of targeting an application with the aim of getting access to the sensitive data of millions. Open-source CMS applications publish their code online, allowing cyber criminals to easily find weak spots and exploit them. Custom CMS applications, on the other hand, are produced in-house so the code is not available to everyone. Need proof? Humble brag time: No sites built on the NPG framework have ever been hacked. It is very likely that your website needs will change over time. You may even be managing multiple websites down the road. You might have one just for mobile users. You may need to add multilingual support. You'll probably have more users to accommodate, or you'll need to increase the permissions of existing ones as your company grows and your staff evolves. Instead of building your CMS around someone else's idea of how a website should work, a custom CMS allows you to build a website that works for you and your users. When new needs arise, the admin interface can be changed to exactly meet your needs. Custom CMS developers can easily make whatever updates or improvements you ask for. As CMS Wire states: "Vendor selection is like choosing a spouse." When you decide to work with a developer or agency, you are selecting a partner for a long-term relationship. You need to find someone who understands your vision and will support you beyond the launch of your site. Obviously, that criteria can't apply to an out-of-the-box application designed for millions of users from thousands of industries. That’s why a custom CMS is the way to go.